Deco's are great markers. You can totally tag with them on a lot of surfaces, even those with sun exposure. The best part is that when you're empty, you can refill these babies. I like to tint the white ones with ink like garvey or DED so that if it gets buffed, there's some ink in there to bleed through. 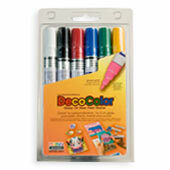 If this is news to you, and you don't already have tons of these markers, you've been living under a rock, (a rock that I tagged with a black Deco.) Primo has the best prices I've seen for these, but you can also get 'em for "free" at####### ,_----(apreply) thank you for the review. But please do not post racking tips on our website.